This tour will seek out the best of Berkeleys fall colors as we use visiting the most notable campus trees as a framework for our walk. As we enjoy the diversity of species, you may learn a bit of history about the development of the campus and a few stories about the people and circumstances behind the plantings, the named groves, landmarks and memorial trees. It seems like every tree has a story. We might even talk about a building or two. He co-authored the Landscape Master Plan in 2004, helped prepare the Landscape Heritage Plan in 2005 and co-authored the Trees of the Berkeley Campus in 2016. He received the Chancellors Distinguished Service Award in 2015. Olive (Olea europa) at Giannini Hall. 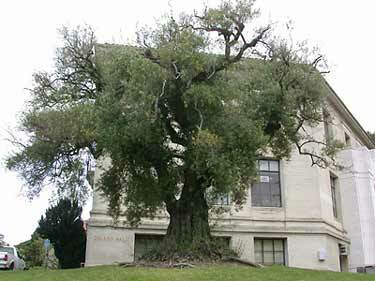 This tree was planted in the late 1800's where Giannini Hall now stands, and was later moved to this location.